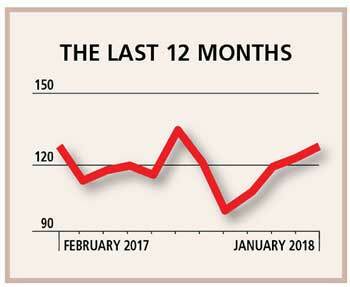 The latest edition of business magazine LMD reports an increase of five basis points in the LMD-Nielsen Business Confidence Index (BCI), from 122 in December to 127 in January. LMD notes that this is the first time since June 2016 that the BCI has improved over four consecutive months with the index standing nine basis points above its 12 month average. He adds: “They do point to the fact that demand for consumption has not yet picked up as inflation is still on the high side. Efforts by the Government to offer price relief… may help shore up consumption levels.” The exclusive monthly survey reveals that 23% of respondents expect the economy to improve in the next 12 months with one businessperson citing infrastructure growth as a sign of progress. In terms of business prospects, LMD notes that a majority of those polled believe business prospects are improving with more respondents expecting sales volumes to increase in the long (38%) and short terms (35%) than in the previous month (28% and 22% respectively). The magazine states that sentiment regarding the investment climate has waned with one in five perceiving the outlook to be bright compared with a quarter of Nielsen’s sample population in the previous month. Media Services, LMD’s publisher, says the February edition of the magazine will be released to leading bookstores and supermarkets on 9 February (for the full BCI report, visit www.LMD.lk).